Artistic and useful, it makes a unique gift that has that personal touch. Here is how to do it. A sea glass night light or switch plate can add a nice touch to your bathroom decor and is a very attractive way to use your sea glass collection. It can also be a nice gift project and can be enjoyed by everyone from the kids to grandparents. 1. At your local hardware or department store, find a flat plastic night light or plain plastic switch plate. 2. Use your smaller pieces of sea glass or beach glass. The night light will have the center where the light shines and you can design your pieces around the center. You might like alternating with tiny shells, sand (craft sand will do if you don't have access to a beach), pebbles, or other small beach finds. 3. Arrange the sea glass or other objects the way you want them to be. 4. Glue the objects. Try not to disturb your original layout if possible. I used Shoe Goo because it goes along way. After I had the glass, shell, and other beach finds glued down, I went back and put a layer of Shoe Goo down and then pressed the sand into the glue and did that the whole way around. You can epoxy glue if you want. 5. After you have glued everything onto the mirror, you can then go back and fill in the empty spaces with small shells, beach pebbles, or sand, depending on the effect you want. 6. Let it dry completely and you're ready to go. This photo is my FIRST sea glass night light I made back in 1999. It is still going strong and being used by my mom in Maryland after 10 years! To find more information on sea glass craft ideas as well as information on various aspects of sea glass collecting, see the links below. Sea glass candles, candle holders or votive holders. 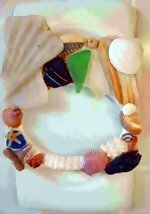 Beach motif mirror or sea glass photo frame. Sea glass wind chimes, suncatchers, or hanging mobiles. Sea glass mosaics or a sea glass tile. Is your sea glass collection valuable? What colors of sea glass or beach glass are the hardest to find? Go from sea glass night light to Odyssey home page. I promise to use it only to send you Odyssey Sea Glass News.